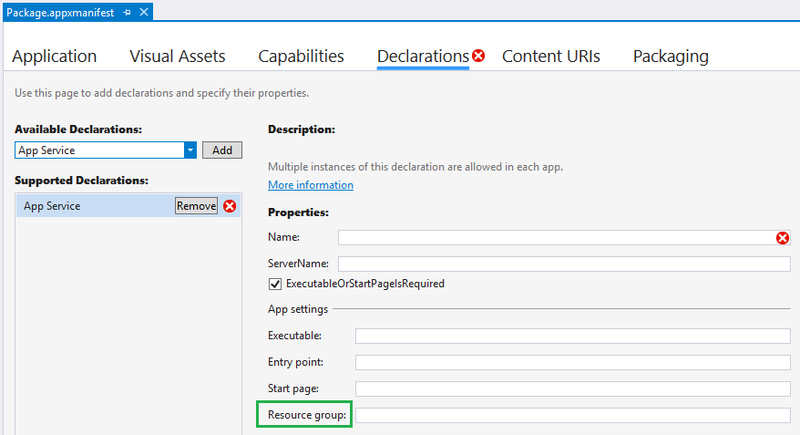 Ensure your app meets the requirements for running background tasks. Consider the following guidance when developing your background task, and before publishing your app. If you use a background task to play media in the background, see Play media in the background for information about improvements in Windows 10, version 1607, that make it much easier. Resilience If your background process is running in another process, a crash in your background process won't take down your foreground application. Also, background activity can be terminated, even within your app, if it runs past execution time limits. Separating background work into a task separate from the foreground app may be a better choice when it isn't necessary for the foreground and background processes to communicate with each other (since one of the main advantages of in-process background tasks are that they remove the need for inter-process communication). Simplicity In-process background tasks don't require cross-process communication and are less complex to write. Available triggers In-process background tasks don't support the following triggers: DeviceUseTrigger, DeviceServicingTrigger and IoTStartupTask. VoIP In-process background tasks don't support activating a VoIP background task within your application. CPU quotas: Background tasks are limited by the amount of wall-clock usage time they get based on trigger type. Most triggers are limited to 30 seconds of wall-clock usage, while some have the ability to run up to 10 minutes in order to complete intensive tasks. Background tasks should be lightweight to save battery life and provide a better user experience for foreground apps. See Support your app with background tasks for the resource constraints applied to background tasks. Manage background tasks: Your app should get a list of registered background tasks, register for progress and completion handlers, and handle those events appropriately. Your background task classes should report progress, cancellation, and completion. For more info see Handle a cancelled background task, and Monitor background task progress and completion. Use BackgroundTaskDeferral: If your background task class runs asynchronous code, make sure to use deferrals. Otherwise your background task may be terminated prematurely when the Run method returns (or the OnBackgroundActivated method in the case of in-process background tasks). For more information, see Create and register an out-of-process background task. Alternatively, request one deferral, and use async/await to complete asynchronous method calls. Close the deferral after the await method calls. Update the app manifest: For background tasks that run out-of-process, declare each background task in the application manifest, along with the type of triggers it is used with. Otherwise your app will not be able to register the background task at runtime. If you have multiple background tasks, consider whether they should run in the same host process or be separated into different host processes. Put them in separate host processes if you are concerned that a failure in one background task could bring down other background tasks. Use the Resource group entry in the manifest designer to group background tasks into different host processes. See the application schema reference for more information about the resource group setting. Background tasks that run in the same process as the foreground app do not need to declare themselves in the application manifest. For more information about declaring background tasks that run out-of-process in the manifest, see Declare background tasks in the application manifest. Prepare for app updates: If your app will be updated, create and register a ServicingComplete background task (see SystemTriggerType) to unregister background tasks for the previous version of the app, and register the background tasks for the new version. This is also an appropriate time to perform app updates that may be necessary outside the context of running in the foreground. Important Starting in Windows 10, apps are no longer required to be on the lock screen as a prerequisite to run background tasks. Universal Windows Platform (UWP) apps can run all supported task types without being pinned to the lock screen. However, apps must call RequestAccessAsync before registering any type of background task. This method will return BackgroundAccessStatus.DeniedByUser if the user has explicitly denied background task permissions for your app in the device's settings. For more information on user choice around background activity and Battery Saver, see Optimize Background Activity. Associate your background task with the correct trigger. Add conditions to help ensure your background task runs successfully. Handle background task progress, completion, and cancellation. Re-register your background tasks during app launch. This ensures that they are registered the first time the app is launched. It also provides a way to detect whether the user has disabled your app's background execution capabilities (in the event registration fails). Check for background task registration errors. If appropriate, attempt to register the background task again with different parameter values. For all device families except desktop, if the device becomes low on memory, background tasks may be terminated. If an out of memory exception is not surfaced, or the app does not handle it, then the background task will be terminated without warning and without raising the OnCanceled event. This helps to ensure the user experience of the app in the foreground. Your background task should be designed to handle this scenario. Create your background task in a Windows Runtime Component. Do not display UI other than toasts, tiles, and badge updates from the background task. In the Run method, request deferrals for each asynchronous method call, and close them when the method is done. Or, use one deferral with async/await. Declare each background task in the application manifest, along with the type of triggers it is used with. Make sure the entry point and trigger types are correct. Do not specify an Executable element in the manifest unless you are using a trigger that should be run in the same context as the app (such as the ControlChannelTrigger). When cancelling a task, ensure that the BackgroundActivated event handler exits before the cancellation occurs or the whole process will be terminated. Write background tasks that are short-lived. Background tasks are limited to 30 seconds of wall-clock usage. Create and register an in-process background task.